Also known as Stationary Rowing. 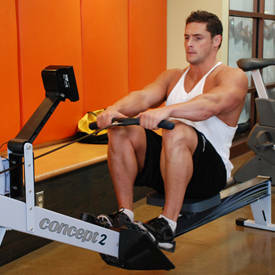 There are three phases of movement when using a rower. 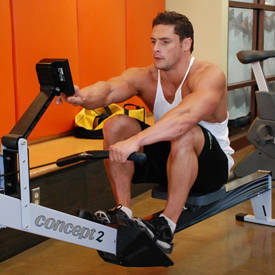 The first phase is when you come forward on the rower. Your knees are bent and against your chest. Your upper body is leaning slightly forward while still maintaining good posture.Next, push against the foot pedals and extend your legs while bringing your hands to your upper abdominal area, squeezing your shoulders back as you do so. To avoid straining your back, use primarily your leg and hip muscles.